The Cartier Pasha has a history stretching back over 70 years. The watch's predecessor was the first water-resistant watch made by this Parisian company. The Pasha's distinguishing feature is a protective crown cap attached to the case with a chain. 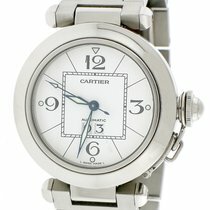 Cartier introduced the first water-resistant wristwatch in the 1930s. Due to the watch's complex sealing system, however, most of these models were only water resistant for a short time. This all changed in the early 1940s. At the time, it was much easier and effective to make round cases water resistant. Thus, in 1943, the Parisian company presented a round gold watch with a screw-down case back and centrally-positioned lugs. 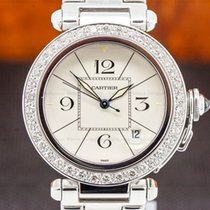 Cartier had placed a protective grid over the watch glass, making it slightly reminiscent of military watches from the First World War. The protective cap for the crown was another defining feature. After winding and setting the watch, the wearer would screw a protective cap on the crown. Losing the cap was almost impossible, as it was attached to the case by a small chain. It's a widespread myth that the Pasha was made in the 1930s at the request of the Pasha of Marrakesh, a great admirer and friend of Louis Cartier. In reality, the Pasha wasn't actually produced or named until 1985. The Pasha's extraordinary crown protector has never undergone any changes and is a vital part of every timepiece. However, the popular dial grid only appears on certain models, making them particularly coveted among collectors. The Pasha collection also included women's models, such as the Miss Pasha and Pasha C, and chronographs like the Pasha Seatimer Chronograph with an automatic caliber and water resistance to 100 m (10 bar, 328 ft). How much do watches from the Pasha series cost? Fans of round watches will enjoy the Pasha collection. You can get a pre-owned stainless steel model with a quartz or automatic caliber for as little as 1,800 USD. The Pasha Chrono is perfect for fans of watches with a stopwatch function. Prices for this precise, quartz-powered chronograph begin around 2,200 USD. Prices for chronographs with an automatic caliber start at about 2,700 USD in very good condition and 5,900 USD new. A mint-condition three-hand model with an automatic caliber demands around 3,500 USD. If you prefer gold watches, be prepared to spend at least 5,300 USD for a pre-owned timepiece. That price more than doubles to around 16,500 USD for never-worn watches. With diamonds, expect prices of about 23,500 USD. Pashas with a grid on the watch glass are rare and coveted cult watches. With any luck, you may be able to get a well-maintained stainless steel version for around 3,500 USD. This timepiece comes with an automatic movement. Plan to spend an additional 1,200 USD for the yellow gold edition. Models with diamonds on the grid are rather feminine. These 32-mm white gold luxury watches cost about 5,900 USD. That price climbs to 8,200 USD if the diamonds continue onto the bezel. In 1997, Cartier launched a limited edition Pasha with a grid in celebration of the company's 150th anniversary. The Pasha 150th Anniversary Limited Edition had a limited run of 1,847 pieces – a reference to the year Cartier was founded. This automatic watch has a red gemstone on the dial and Roman numeral hour markers. A well-maintained Pasha 150th Anniversary costs about 4,100 USD. The Cartier Ballon Bleu is also round and first premiered in 2007. These models have a protected crown featuring a blue sapphire gemstone. The price for a pre-owned quartz model is around 3,500 USD. New watches with leather straps and quartz calibers cost around 4,700 USD. Prices for a new automatic Ballon Bleu sit in a similar price range. If you're more passionate about square watches, you may find the Cartier Santos or Tank more attractive. Both are among the most iconic watches in the Parisian company's catalog. The Santos was one of the first pilot's watches in the world. Pre-owned, it's available for less than 1,200 USD. New models powered by quartz calibers cost around 4,100 USD. New, automatic versions start around 4,700 USD. You can purchase a pre-owned Tank in good condition for around 590 USD. New, this timepiece costs around 2,200 USD with a quartz movement, and 3,400 USD with an automatic movement. While the Pasha Seatimer Chronograph isn't suited for deep sea diving, its 100-m (10 bar, 328 ft) water resistance is more than enough for swimming and snorkeling. Even so, this 42-mm chronograph comes with a unidirectional diving bezel, which can be used to measure time. Pink gold models with a black dial are especially elegant when worn on a pink gold bracelet with black rubber links. These timepieces demand anywhere from 20,000 USD pre-owned to 24,700 USD in mint condition. You can save quite a bit by purchasing a stainless steel model, which changes hands for as little as 4,100 USD. The Pasha Seatimer is also availalbe as a three-hand watch with an automatic movement and the same level of water resistance as the chronograph. The stainless steel version usually has a black or white dial and sells for about 2,400 USD. There are also plenty of smaller, 33-mm models available for more feminine wrists. The Cartier Miss Pasha is targeted specifically at women. It has a small diameter of 27 mm and is only 7.6 mm thick, making it perfect for thinner wrists. A precise quartz movement keeps the watch running accurately. The crown cap is set with a synthetic spinel cabochon. A cabochon is a gemstone that has been shaped and polished, but not faceted. The dial is available in pink or silver, and the band is offered in textile or stainless steel variants. The Parisian company uses stainless steel or gold for the case. Diamonds adorn some models, bringing their prices up to around 23,500 USD. More affordable stainless steel models cost around 2,900 USD. The Pasha C is not exclusively for women; however, at 35 mm, it is on the smaller side for a men's watch. The Pasha C with a GMT function is especially practical since its rotatable bezel makes setting a second time zone a breeze. This is especially useful when traveling. What's more, these timepieces also have a date display at 5 o'clock. Fittingly, a globe made up of latitudinal and longitudinal lines decorates the dial. You can purchase a Pasha C with a GMT function for about 2,100 USD in very good condition. The Cartier Pasha Flying Tourbillon Skeleton is a masterpiece of haute horlogerie. Its 18-karat white gold case is 42 mm in diameter. The dial consists of the bridges of the in-house manual caliber 9457 MC, which has a Geneva Seal . The Geneva Seal is a mark of quality and origin for mechanical watches built and regulated in the canton of Geneva. The highlight of this watch is the tourbillon at 6 o'clock. Abraham-Louis Breguet invented the tourbillon in the 18th century. To this day, tourbillon watches are still considered to be watchmaking masterpieces. The Cartier Pasha Flying Tourbillon Skeleton costs around 85,000 USD.